Why add the stiff leg deadlift and romanian deadlift to your training? Why do you need to include both in your deadlift training? Isn't the conventional deadlift enough? The stiff leg deadlift (aka the straight leg deadlift) is a vital accessory exercise. Here is why – many exercises are quadricep dominant. Particularly squats and deadlifts. The stiff leg deadlift on the other hand is hamstring, glutes and back dominant. If you just started weightlifting or powerlifting, there is a good chance you do not do stiff legged deadlifts. Here is the problem with that – when you neglect essential muscle groups, you miss the opportunity to get even stronger. A strength building program of only squats and deadlifts will leave your posterior chain lagging behind your ‘mirror' muscles. The powerful muscle groups that are on the rear of your body are your posterior chain. The back of your legs, calves, hamstrings, glutes, and your lower and upper back. The mirror muscles are those you see in the mirror. They typically gets extensive training. Curls, shoulder presses, and squats are all mirror muscle exercises. Do not leave out the non-mirror muscles, the back half of your body from training. The stiff leg deadlift will isolate the focus to your posterior chain, as opposed to the conventional deadlift. Therefore, the stiff leg deadlift and the conventional deadlift are great choices for total body development. The stiff leg deadlift will build a brutally strong back. This will help your deadlift, squat, and almost any other lift. This is according to someone who truly knows, strongman and powerlifter Alan Thrall. Don't just strengthen the front of your body. Work the back of your body as well with the stiff leg deadlift for total body strength and fitness. In the conventional deadlift, you rely on your quads and leg drive for the initial push against the floor. The conventional deadlift starts like a vertical leg press, pushing against the floor to start lifting the weight. In the stiff leg deadlift, you use your glutes, hamstrings and back to lift the weight. As a result, you target your entire back to lift the weight from the floor. With progressive resistance and great form, your back will increase in size and strength. The stiff leg deadlift will fully engage your glutes, hamstrings and calves. This builds their size and strength which complements the quadricep training you do with regular squats and deadlifts. Building your entire posterior chain will benefit you whether you are an athlete or not. You improve your mobility and performance for all activities through total body development. To build the greatest size and strength possible, you want to focus on your posterior chain as well. Why? Because only training the front of your body leaves a very import half, your rear. Strengthening the rear of your body will increase your total body strength and size. As a result, you will be able to reach your squat and deadlift potential that much faster. Keeping your bones and muscles as strong as possible is critical if you are over 50. No one wants to be using canes or walkers if they can help it. Constant sitting kills off your muscles. They atrophy the more that you sit without subjecting them to resistance. Your body thinks that you no longer need much muscle. It is time to tell your entire body that you want to have stronger muscles and bones. Resistance training is one of the best ways to accomplish this. Deadlifting will keep you functional, mobile and young. That is not a pipe dream. See how deadlifting improved the mobility of an 80 year old grandmother. “Studies show that the primary cause of most knee injuries is weak quadriceps followed closely by weak hamstrings. In my experience, with most athletes, it’s the hamstring component. 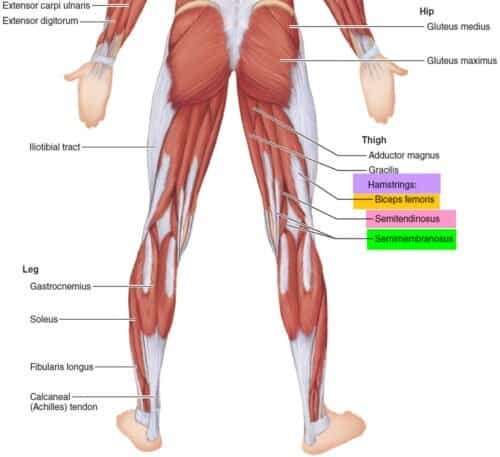 The vast majority of hamstring injuries occur in the biceps femoris and the semitendinosus. As with any deadlift variation, you want to perfect your stiff leg deadlift form. Some people think that your legs must be stiff, or straight. But you have to take your own body composition and structure into account. The main point is that you do not want to use your leg drive to power your lift. You lift with your back (keep it neutral straight), hinging at the hips and keeping your hamstrings loaded. This is the key difference between a regular and stiff leg deadlift. Because this is a back intensive lift, use light weight, perfect form and increase the weight of the lift gradually. You minimize the engagement of your quadriceps and leg drive. And maximize the usage of your hamstrings and back to power the lift. This is how the stiff leg deadlift makes your normal deadlift and all other lifts stronger. Your calves, hamstrings, glutes and back get stronger. As a result, your regular deadlift will get much stronger. Because you are adding back the power of your legs in the conventional deadlift. 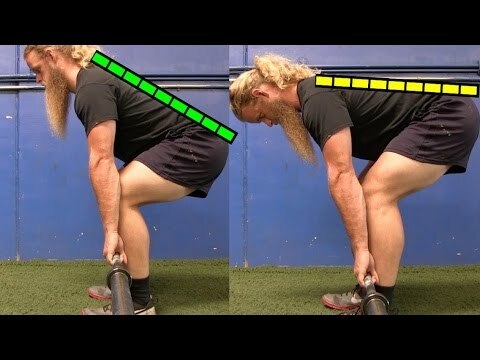 The stiff leg deadlift and the Romanian deadlift are very similar. In fact they appear to be the same lift. There are a couple of key difference which you can use to your advantage. 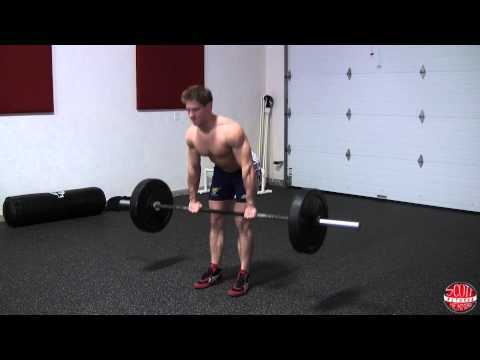 The Romanian deadlift is an excellent tool to learn how to deadlift. This is because the Romanian deadlift begins at the top, while you are standing and holding the barbell. In contrast, both the stiff leg deadlift and that conventional deadlift start from the floor. They both have a deeper range of motion than the Romanian deadlift. The Romanian deadlift is a safer way of learning the the deadlift. Because you begin the Romanian deadlift in a standing position. Then you lower to your knees or shins. As far as your hamstring flexibility allows. You can tell as long as you can keep your back straight. Last you reverse the movement and lift back to a standing position. The Romanian deadlift also helps you get stronger in the second half of the deadlift. This is when the barbell reaches the knees, and you push through with your hips to stand tall. The conventional deadlift is often called the king of all exercise because of its incredible fitness benefits. Whether you are young or over 50. Or you play yourself in life or are an actor, work in an office or are an athlete. If you are a, runner , powerlifter or even if you have scoliosis. You still want to deadlift. At least once a week. The Romanian deadlift teaches you how to deadlift. While the conventional deadlift is your bread and butter for health and strength. The stiff leg deadlift augments your body strength and size by isolating the posterior chain. Whether you are an athlete, or a business person. Or a retiree looking to get leaner and stronger. The stiff leg deadlift is an important deadlift variation to add to your training. Read the entire post now to find out why. Pin the image below to share this post on the stiff leg deadlift, Thank you!